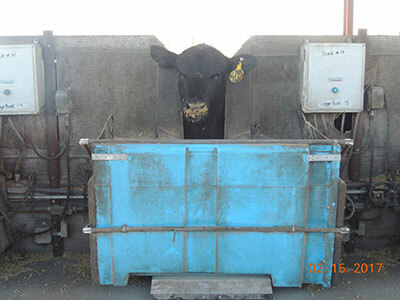 Werner Feed Efficiency Testing Center is a custom feed intake testing facility that evaluates individual feed intake on bulls and heifers. At the end of the test, consignors will receive individual RFI, RADG, Feed:Gain, and Cost of Gain on each animal. What do those numbers mean for you? A lot! Click here to find out more. Cattle come into the facility and begin a 21-day warm up. This is a period to get them acclimated to the facilities and feed bunks. Within the first day or two the cattle are here, they will be vaccinated against Blackleg and viruses, dewormed, as well as tested for Persistently Infected BVD (PI). At this time, cattle will receive an EID tag which will allow us to track how much they eat every day. After the warm-up, the official test begins. When the cattle go on test, they are weighed two days back to back and the weight is averaged for the “On Test Weight.” Then the amount of feed each animal eats each day is monitored for 70 days. At the end of the test, cattle are again weighed two days back to back and the “Off Test Weight” is the average of those days. 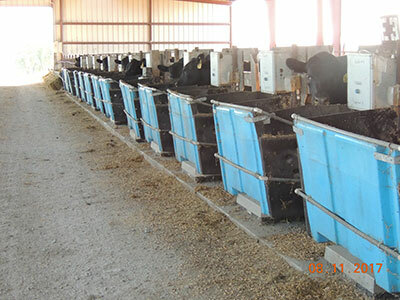 When the test is complete, the daily feed intake and the average daily gain are sent to Iowa State University where the data is computed to calculate RFI (Residual Feed Intake), RADG (Residual Daily Good Intake), Feed: Gain, and Cost of Gain. This data is then sent back to you as well as your breed association if you would like. Feed/Bedding/Yardage: Currently, it runs about $90/month/head. This value fluctuates with the price of feed ingredients. Vaccinations: The initial vaccination/deworming/PI test costs about $15/head. This value fluctuates with the price of medication.